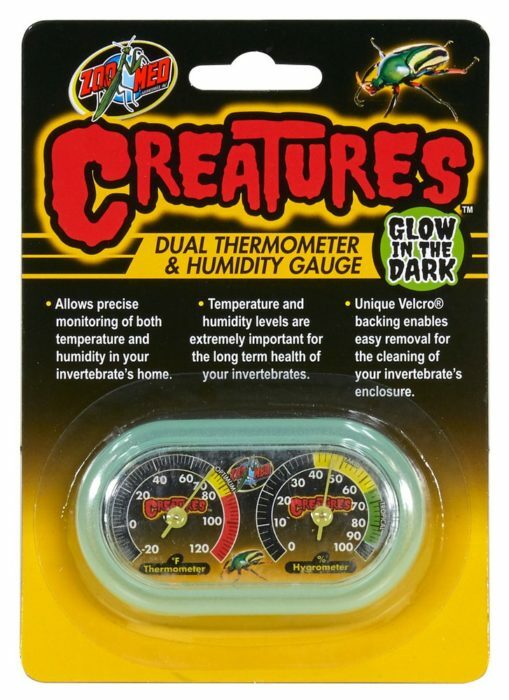 Creatures™ Dual Thermometer & Humidity Gauge | Zoo Med Laboratories, Inc. The Creatures™ Dual Thermometer and Humidity Gauge allows for precise monitoring of both temperature and humidity in your invertebrate’s habitat. Easy to set up! Glows-in-the-Dark! Allows precise monitoring of both temperature and humidity in your invertebrate’s home. Unique hook and loop backing enables easy removal for the cleaning of your invertebrates enclosure.